This beginning programming continues to inform everything. I remember several years ago walking on the tarred bike path in my neighborhood and seeing something remarkable. There, in the tar path, to my utter amazement, a crocus had burst forth from the tar itself! It was awe inspiring to think of the effort this fragile flower put forth to reach the sunlight so that it could bloom into who it really was and not wither in the dark of the soil under the tar. It is incredible what we as human beings, like the crocus, innately go through to reach our full potential. It is in us like breathing and so organic and natural that we come to the process of becoming our whole selves over and over until we burst through our own version of tar and into the sunlight of awareness. We are comprised of body, mind, and soul and each of these travel journeys of growth and integration with the whole of who we are throughout our lives. As we grow, heal, and evolve we become stronger in our sense of self and with our interactions with others and the world. As we follow this innate urging we step forward towards our highest potential. Our bodies have evolved over the centuries in order to adapt and survive and to reach our highest ability to continue our species. Over time our bodies have become more and more complex as has our understanding of them, treatment and care of the body. It is so with the human mind as well. We’ve come to understand the mind and how it works and how the brain is effectual in so many domains of our life and experience. The sophistication of it all is unbelievable as we move forward and evolve our own complexities and expansion of new ideas, connecting the dots, and gathering information. It is so with the soul too; that inner self that lives deeply within our heart, psyche, unconscious and conscious awareness. 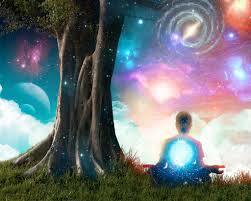 We have come to understand many aspects of the non-tangible world and our deeper self. We are living in a time where everything seems to express itself in an explosion of jaw dropping proportions. The larger picture expresses the macro experience of the whole and the micro picture expresses the individual experience. The qualities in the macro can be seen in the micro. We are bursting forth on both of these levels! The impact and largeness of this is almost unimaginable as was the act by the single crocus pushing through great odds to the light! It is this inner force made of the intangible that inspires, motivates, moves us, beckons to us, and urges us to move forward, to do it better, find out more, live larger, and become. To live on the edge of this urge is where the evolutionary line is and where visionaries, luminaries, and those being called to move forward stand. It isn’t always an easy line to toe, but following this evolutionary flow will indeed move us forward both individually and collectively. Personal evolution is the process of individuals standing at their own evolutionary lines and consciously choosing to expand that line of potential. It is soul reaching. It is answering the inner call to look within, build your awareness of this inner self and inner experience; to dance with the Divine within ourselves and embrace all the parts of ourselves that would lead us towards our fullest potential and for wholeness. It is a call to nurture the whole of ourselves and to contribute to the parts that comprise the whole: the body, mind, and soul. Awareness is always the first step in any evolutionary process. Sometimes awareness is the most challenging step. Imagine how the crocus felt when it came upon the barrier of tar in the soil. It must have been confusing at first and then disheartening, and maybe even panic set in. That precious flower had to renegotiate, find its own resilience, and forge a plan for forward movement. This is the path of personal evolution and awareness is one of the most important tools in this process. How do we build awareness and stand on our own evolutionary edges? We follow the inner urge. We inform ourselves, set aims and goals, find our “tribe”, find someone to help us integrate and express our feelings, take classes, discover the wonderful aspects of ourselves and celebrate them within ourselves and in community. Thomas Leonard, a teacher and coach on the topic of personal evolution, feels strongly that awareness in personal evolution matters. He states: “If you want to evolve faster, one place to start is to increase your awareness.” He has come up with a list of reasons why increasing your awareness is a key component to personal evolution. 1. When you are aware, more things in life make sense. This is because you have enough perspective to have a helicopter view of life and can see people, events and problems from all angles, not from just the ‘me’ angle. 2. When you are aware, you notice things when/as they occur, not later. This is because you have become sensitized and there is less of a buffer delaying your feelings. 3. When you are aware, you will react less and respond more. This is because, you see/feel things before they become a problem or crisis. When you see stuff early enough/immediately, you have time to respond instead of going in a survival/emotional reaction. 4. When you are aware, solutions to problems become more obvious. This because you will naturally see ‘more’ when you are aware and in that ‘more’ will be a solution. 5. When you are aware, there is less resistance. 6. When you are aware, you attract others who are similarly evolved. 7. When you are aware, you can handle paradoxes that would stall most people. Even if you cannot resolve the paradox, you can much more easily live with it, because you know it is these paradoxes and conflicts which make life complex/rich. 1. Surround yourself with new ideas instead of recycling your beliefs. Beliefs can limit your ability to experience life as it unfolds. Nature nourishes and recalibrates our natural systems. 3. Continuously integrate all aspects of your life. Integration evolves you from being needlessly complicated to being richly complex. 4. Design your sources of energy. You can then operate at a higher frequency. Take classes, exercise, be around people who inspire you, support the expression of your authentic self, nurture mutuality in all your exchanges. Reduce the energy you consume by 90% by reducing your resistance to life. 6. Surround yourself with people who are eagerly evolving. They spark you. You spark them. Evolution occurs effortlessly. 7. Choose a goal that is bigger than you are. Be pulled forward by it, instead of pushing yourself. 8. Learn how you naturally operate. Come to honor your personal dynamic. And design your life to fully express them. Healing maximizes your emotional IQ. Evolutionary flow is already programmed into you. All you need to do is tap into it by listening to your inner voice, your inner drum beat and follow it, bravely, consciously, and lovingly and then find the tools, people and means by which to find and know your authentic and whole self.